Peacegiver includes a collection of deeply moving inspirational music that will guide listeners to a place of harmony and tranquility. 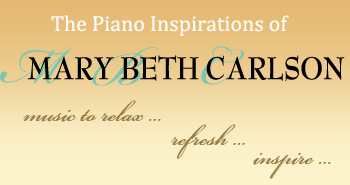 Moods created by Mary Beth's emotive piano performance with a world class string and woodwind ensemble enhance a healing sense of serenity, joy and well-being. You will be gently reminded of the source of peace and promise as you experience Peacegiver. Enjoy a blend of familiar yet refreshing favorites and popular choruses including Dove Award Winners. Peacegiver, with 74 minutes of comforting music, presents Mary Beth's artistry at its finest!